The western portion of the Pyrenees is also called Pyrenées Basque or Pyrenées Atlantiques. Its highest point, the Pic d'Anie at 2504 meters above sea level, lies in the far east. From there, the mountains drop to the west towards to the Cote Basque. For the most part it is a gentle low mountain range, which is dominated by deciduous forests and meadows. From this area stems the Frenchest of all French garments, the Basque beret. It was worn by the shepherds around Oloron-Sainte-Marie as protection from the sun. The town with its 10,000 inhabitants has a lively atmosphere and is situated at the foot of the Pyrénées Aquitaine. 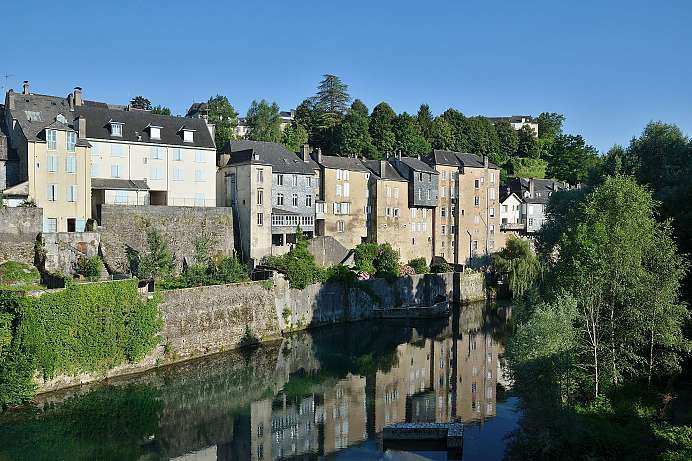 Here two rivers meet, forming the Gave d'Oloron and creating an idyllic image. To the west of the city stands the Church Sainte Marie, dating back to the 12th century. Above its portal apocalyptic motifs are shown alongside scenes of medieval life.